SUMMARY: Double sad news outside my dog world. 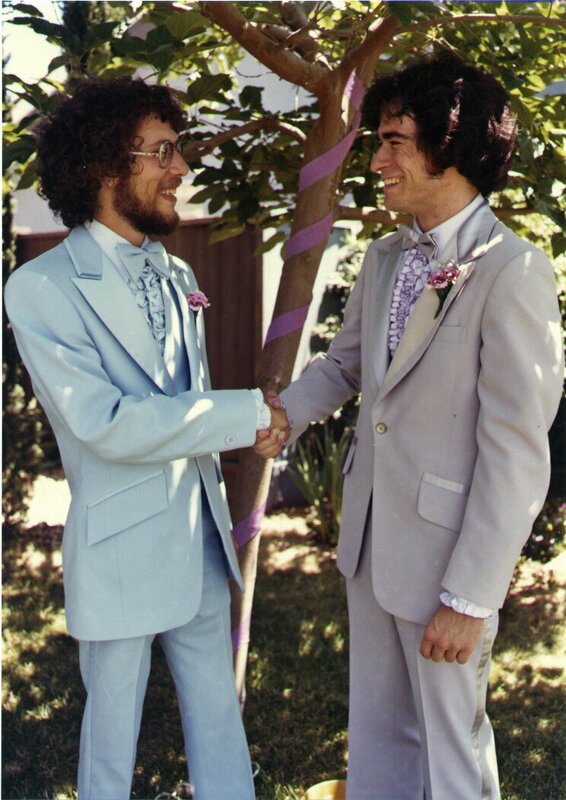 Best Man (left) and groom, 1981. Weren't we all so much different then! Twenty-seven years ago, I got married. That lasted barely into the new millennium, but friendships from those years continued. I've stayed in touch with the mother of our Best Man. I always felt that they were a close and loving family (two siblings? Three?) and they always made me feel part of their family. We'd drifted apart from the Best Man, who had descended into alcohol and drugs, had spent time more than once in jail on DUI convictions, owed everyone way too much money. Not part of our world. Never knew what demons drove him so far from the paths taken by the rest of his family, from whom he had become estranged. Two weeks ago, the mother let me know that her husband had died very suddenly. They weren't that old, I don't think. Of course my perspective on what "very old" is has changed considerably through the years... 110 is "very old" now. Maybe in their 70s? The bigger shock was to get another note today that our Best Man had just been found dead in a motel room, cause unknown. It is such a stereotypically sad and lonely death for someone who had gone in his direction. I wonder whether he knew that his father had just died, and if so, whether that was too much for him? He was such a funny, energetic guy in the old days. Lots of dreams that never came to fruition, but he was fun to talk to and hang around with. And image the Mother--what a month. And she's selling the house and has to find a home for the husband's basset/dachshund. Her whole life turned topsy turvy. I can barely imagine. I am sad about all of them. Very very sad story. Such a hard time for her, almost beyond understanding I'm sure. Makes the rest of us realize how lucky we are. What a sad story. Addiction is such a terrible thing - the son she knew was probably gone a long time ago. Healing thoughts and prayers to her, I hope she can find some peace.